PSFP-100-M2LC2 Fast Ethernet SFP Optical Tranceiver. 100BASE-FX 1310 nm multimode (LC) [2km / 1.2 miles]. A fiber to Ethernet solution using interchangeable, compact media connectors that enable a single network device to connect to a wide variety of fiber and copper cable types and distances. 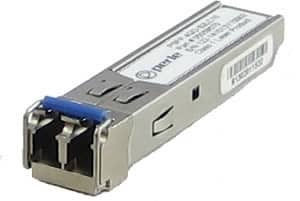 For use with Perle'sFP Media Converters and third party equipment that supports MSA compliant SFP transceivers.